Removing moisture invariably produces water as a by-product, so a waterless dehumidifier sounds like a paradox, but it’s not. The Rosahl membrane dehumidifier uses electrolysis to remove moisture from enclosures. One of the main advantage is that the process is maintenance free, and requires no draining or cleaning. A Rosahl membrane dehumidifier is normally mounted in a cut-out in the side of an enclosure. It works using a solid polymer electrolyte (SPE) to remove moisture from the air inside enclosures and expel it using electrolysis when a 3V DC voltage is applied: it provides clean moisture extraction at a low cost. Rosahl dehumidifying membrane, the SPE is porous. When a 3 Volt D.C. voltage is applied, moisture inside the enclosure separates into hydrogen (ions) and oxygen. The hydrogen ions are forced through the membrane to be discharged on the outside where they immediately react with oxygen in the air, resulting in water vapour being discharged. For some applications, the SPE membrane can be reversed and used as a humidifier. Protects remote or hard to service equipment. 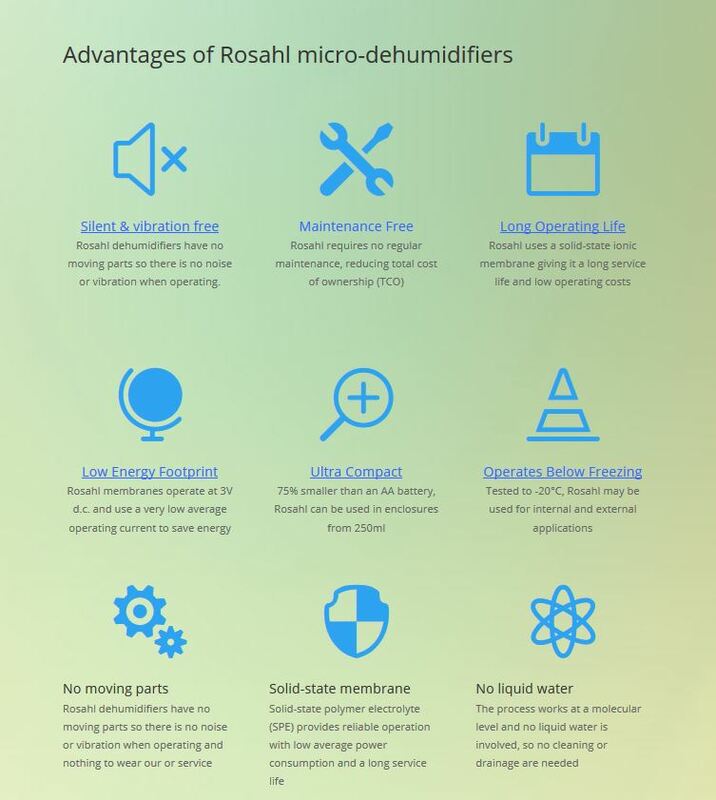 Rosahl membrane dehumidifiers are available in various sizes to suit enclosures volumes from one litre up to 4 cubic metres. And will work where the ambient relative humidity is up to 95%. Go here for an introduction to membrane dehumidifiers, and here for application and selection information.